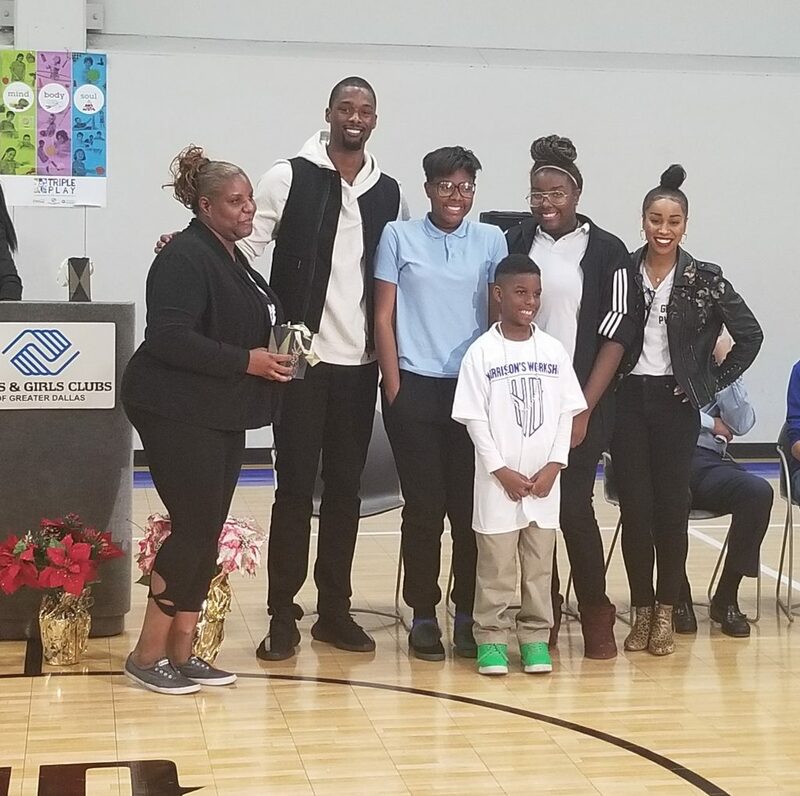 Harrison Barnes Adopts Club for Holidays! We are so overwhelmed with joy and gratitude for the generosity of Brittany and Harrison Barnes, basketball player for the Dallas Mavericks. Mr. and Mrs. Barnes adopted our Oak Cliff Boys & Girls Club location to ensure every child served by this Club received a gift this holiday season. Through their foundation, they sponsored the Club’s holiday party where they fed and provided gifts for over 120 kids. On top of that, four Club members were selected as Club All-Stars and received a pair of Adidas shoes. With the help of Club staff, Mr. and Mrs. Barnes selected four deserving families to receive a $200 gift card to help cover the cost of Christmas dinner and gifts for the family. These families were surprised with the gift cards at the holiday party, in which they expressed tears of gratitude. Harrison Barnes first reached out to Boys & Girls Clubs of Greater Dallas in 2016, when he first relocated to Dallas to play for the Mavericks. His desire to give back to the community he resides in is evident in the time, money and resources he has invested into the youth thousands of youth served by our Clubs. As a Boys & Girls Club alum from his home town, Mr. Barnes has proven over and over that he is still a Club kid at heart. Since 2016, he has donated 10 tickets to every home game so our kids could have the experience of going to a professional sporting event. If you are doing the math, that’s about 400 tickets a season (about 40 home games). However, most notable is Barnes’ sponsoring of a $54,000 basketball court renovation at our Oak Cliff Boys & Girls Club location. A ribbon cutting for the court took place, following the holiday party. Boys & Girls Clubs of Greater Dallas cannot thank Mr. and Mrs. Barnes enough for their commitment to enriching the lives of our youth. We can only hope they call Dallas home for many years to come and continue to be a part of our Boys & Girls Club family.